About a year before we left on this trip Andrew’s parents generously gifted us a subscription to National Geographic Traveller magazine. We enjoyed reading all of the issues, but one article in particular really stood out. It was called ‘On The Trail Of The Silk Road’ and was an overview of why you might want to travel to the Central Asian countries popularly known as ‘the Stans’ – Kazakhstan, Krgyzstan, Tajikistan, Turkmenistan and Uzbekistan. 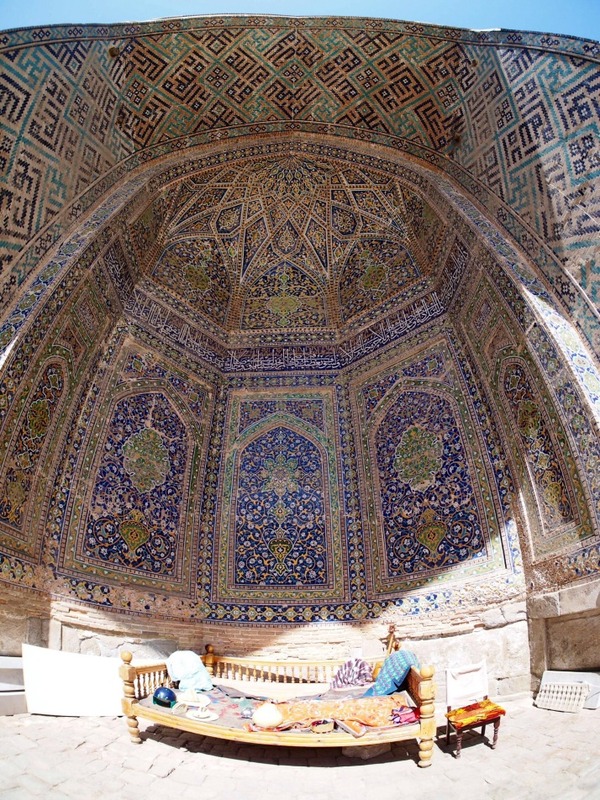 We found the whole article fascinating but the picture of the Registan in Samarkand just blew our minds and we instantly started thinking about how to work at least Uzbekistan into the plan. 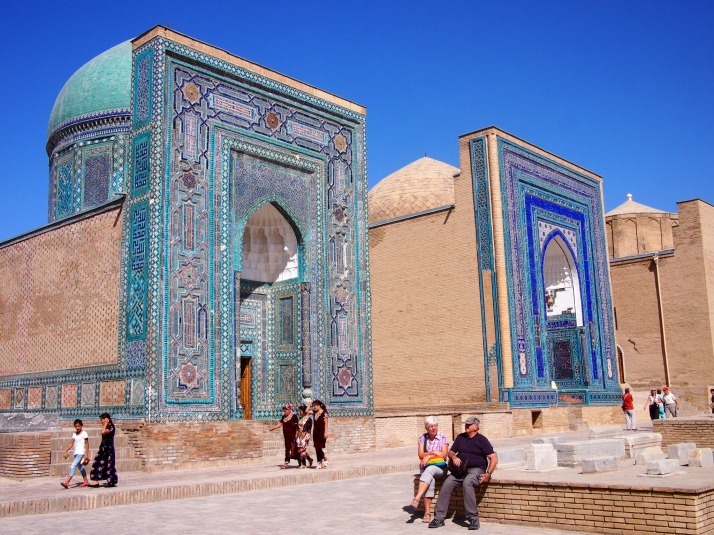 Samarkand has been around for at least 2500 years and was a hub city on the Silk Road with all kinds of goods passing through from China, India and Persia towards Europe and vice-versa. 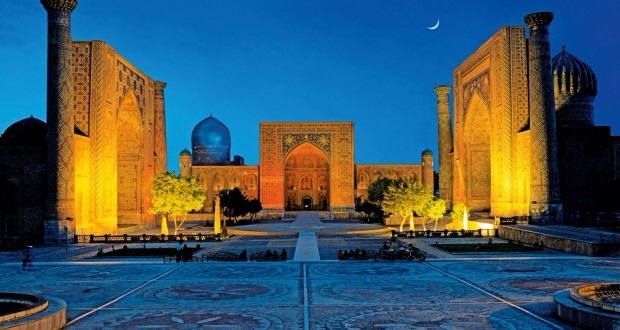 In 1370 Amir Timur decided to make Samarkand his capital and the following decades saw the construction of majestic medressas, mausoleums and mosques. 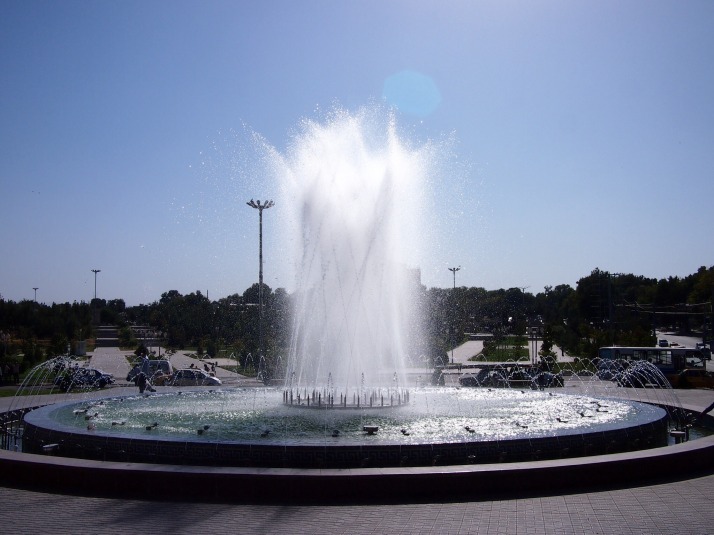 Nowadays it is a pleasant city with wide tree-lined streets and numerous fountains in between the historic sights. 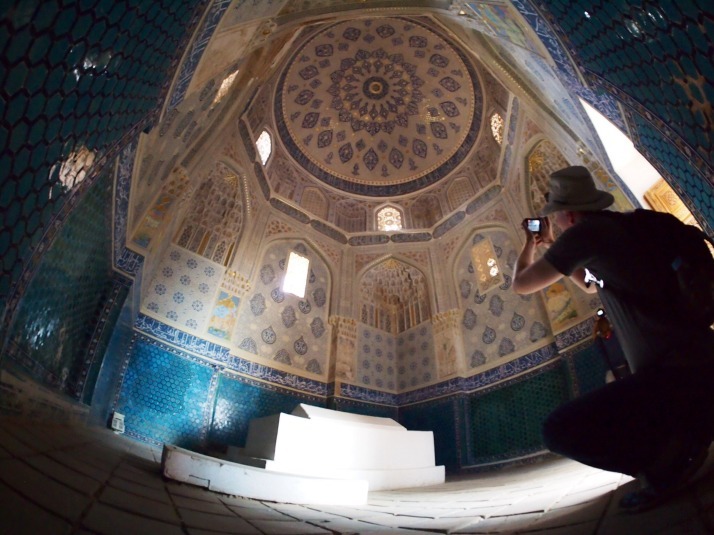 The city is littered with impressive looking mausoleums but without doubt the most spectacular is the Gur-E-Amir Mausoleum which houses the remains of Amir Timur, his sons and grandsons. It was a two minute walk from our guesthouse so we passed it at least twice every day and struggled to stop ourselves taking more photos each time! It was very difficult to stop ourselves from taking photos every time we walked past! Inside, the walls and domed ceiling above the marble grave markers are covered in blue and gold paintings. On our first afternoon in the city, Andrew, Jo and I walked up to Registan Square to catch a glimpse of the buildings which had inspired us all those months earlier. The only word that any of us were capable of for several minutes afterwards was “wow”! 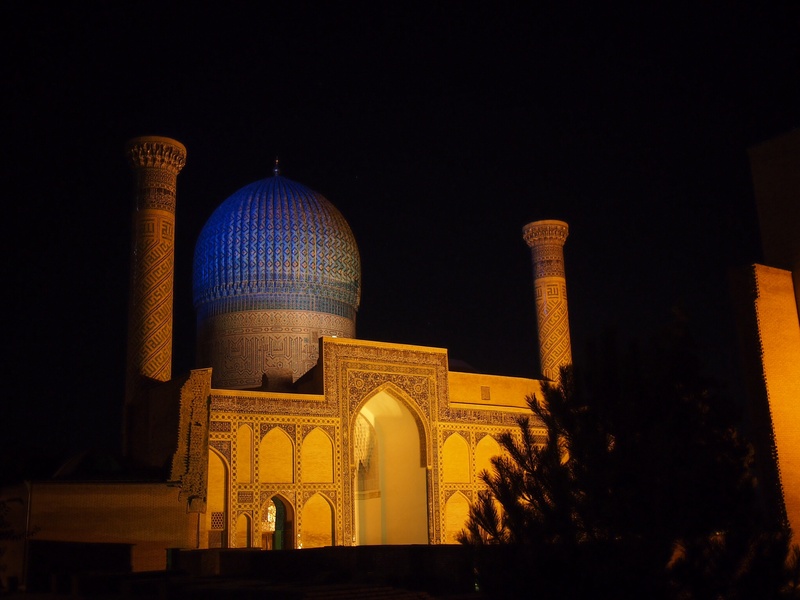 We visited the site several times during our stay including at sunrise and at night and the magnificent buildings never ceased to impress us. 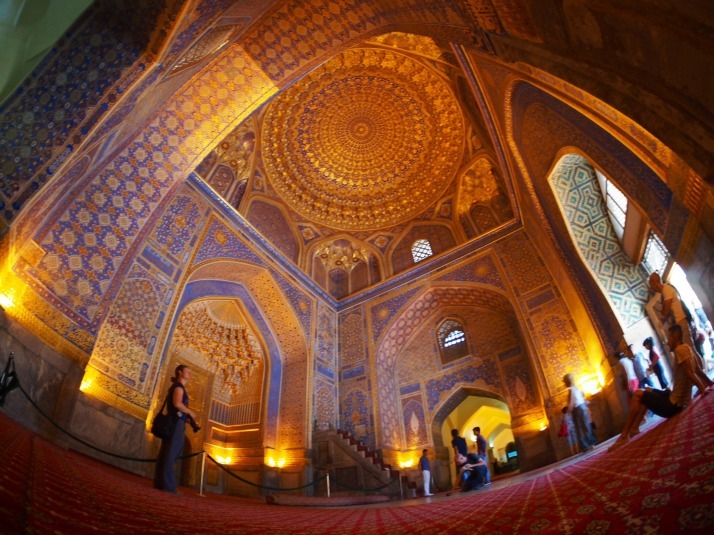 A medressa is an Islamic school or college. Historically they taught a range of subjects to educate their religious leaders. We figured that Samarkand’s medressas were probably a bit like the colleges of Oxford and Cambridge which originally were principally engaged in educating priests. All of the buildings have been heavily restored and it was interesting to see photographs of how dilapidated they were at the beginning of the 20th century before work began. All three medressas have a similar structure; behind the elegant tiled facade is a courtyard surrounded on all sides by small rooms which would once have housed the students who were taught here. Nowadays most of the students’ cells house craftspeople and souvenir shops. 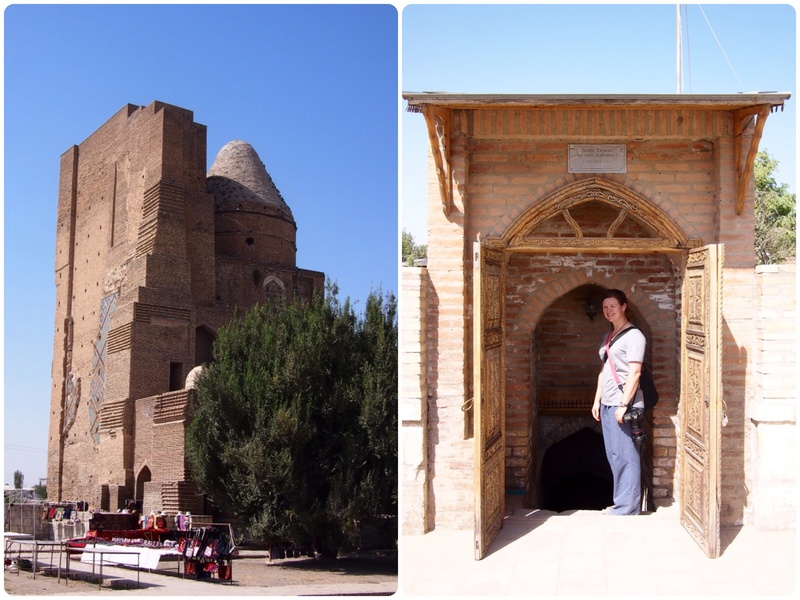 Our first stop was at the oldest, Ulugbek Medressa, built by (and named after) Amir Timur’s grandson, it was completed in 1420. Ulugbek was a renowned scholar, particularly famous for his astronomical observations. 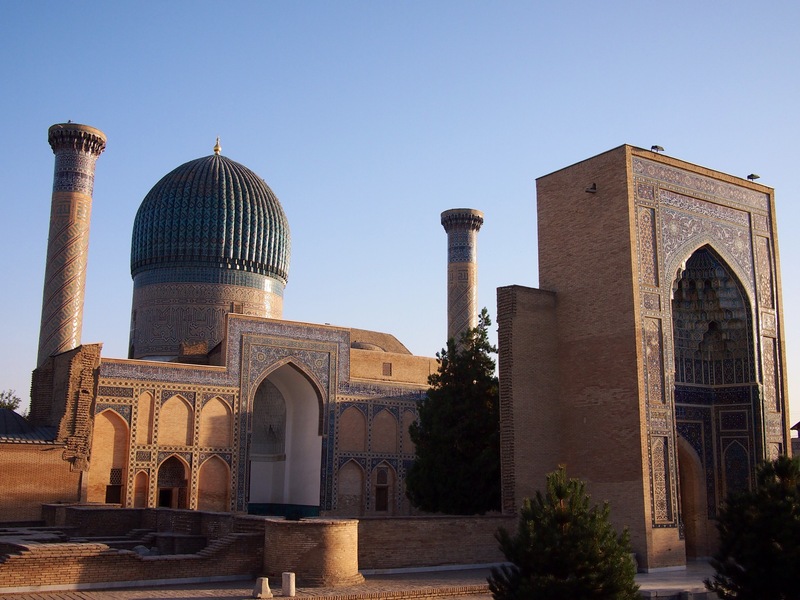 During his rule, Samarkand became an intellectual centre. Tilla-Kari Medressa along the back of the square has a tree filled courtyard and also contains an elegant mosque with beautifully decorated walls and ceiling. One of the stalls inside the mosque was selling unusual ceramic Christmas decorations in traditional Uzbek patterns. We were very tempted but the vendor was asking a high price, in the end we walked away thinking we would see similar ones elsewhere but we never did. 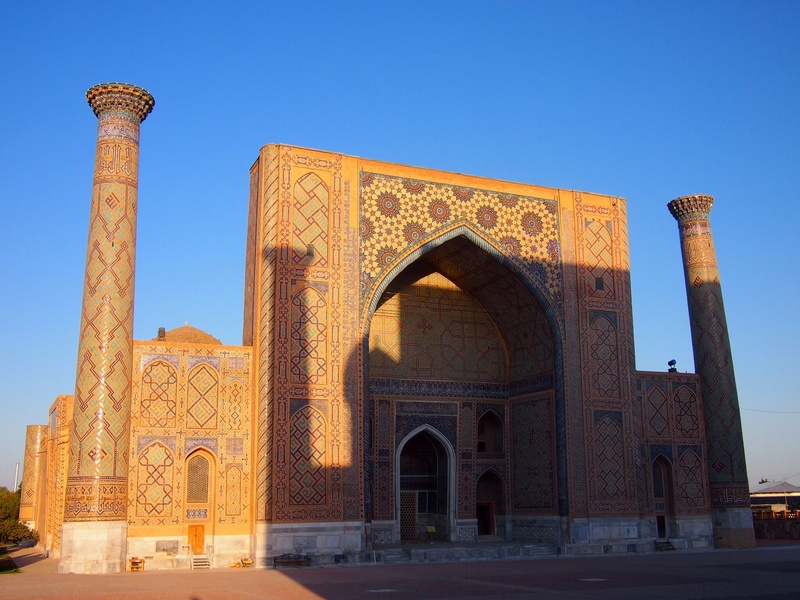 On the eastern side of the square is Sher Dor (Lion) Medressa with its distinctive tiled lions (which look more like tigers to us) above the arch of its facade. They’re famous throughout the country and even feature on the UZS200 note. 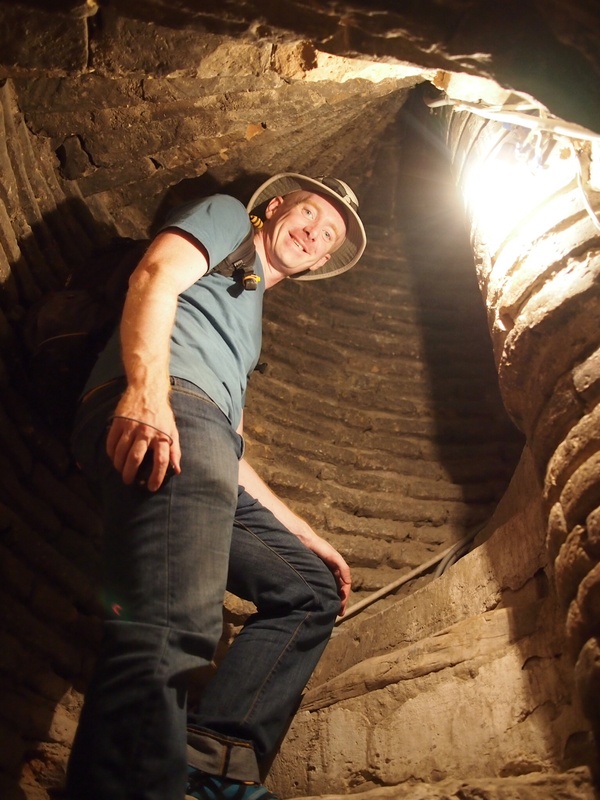 As we were leaving, one of the security guards pulled Andrew aside and asked if we would like to climb one of the minarets of Tilla-Kari Medressa for an extra fee of 6,000 sum (about £1.20). We’d read that it is normal practice for the guards to offer extras like this and agreed on 15,000 sum for the three of us. Tilla-Kari’s minarets are much smaller than those of the other two buildings but we enjoyed the slightly different perspective that a couple of extra storeys provided as well as the thrill of doing something illicit! 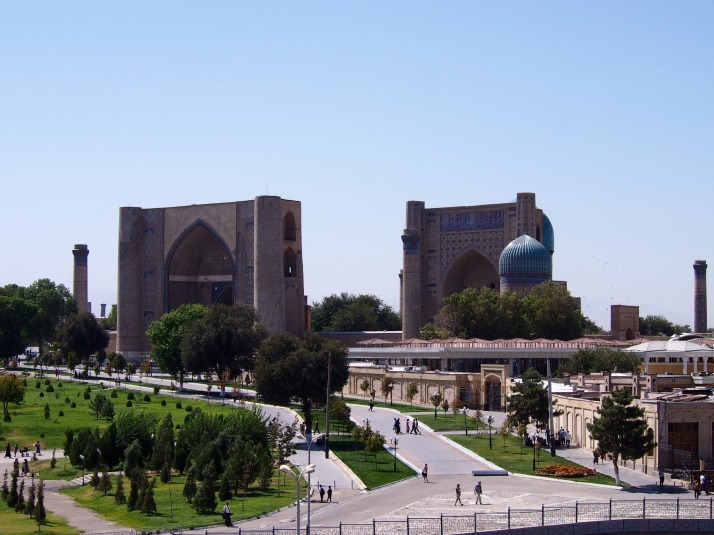 North-east of the Registan the Bibi Khanym Mosque towers over the surrounding market and park. It is named for Amir Timur’s Chinese wife and was once one of the Islamic world’s largest mosques. 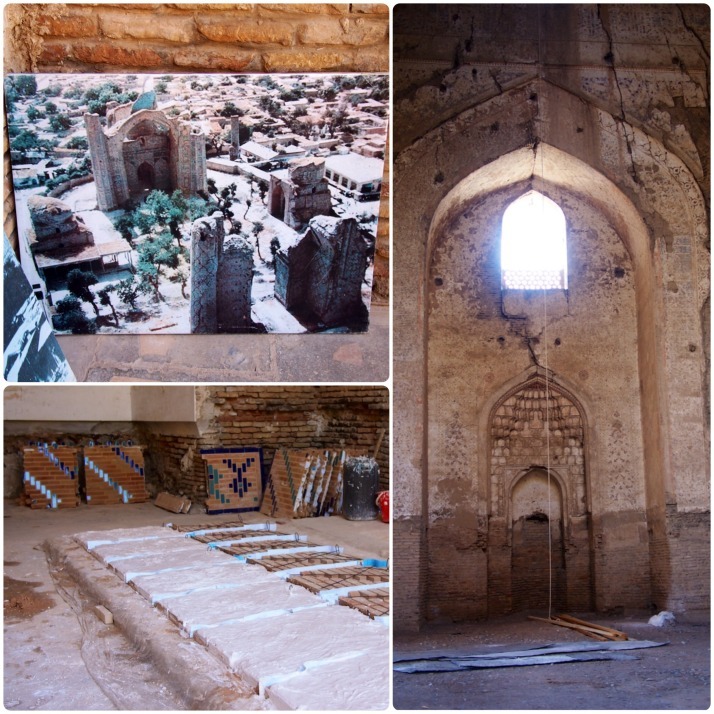 Somewhat crumbling in places, restoration work is ongoing. 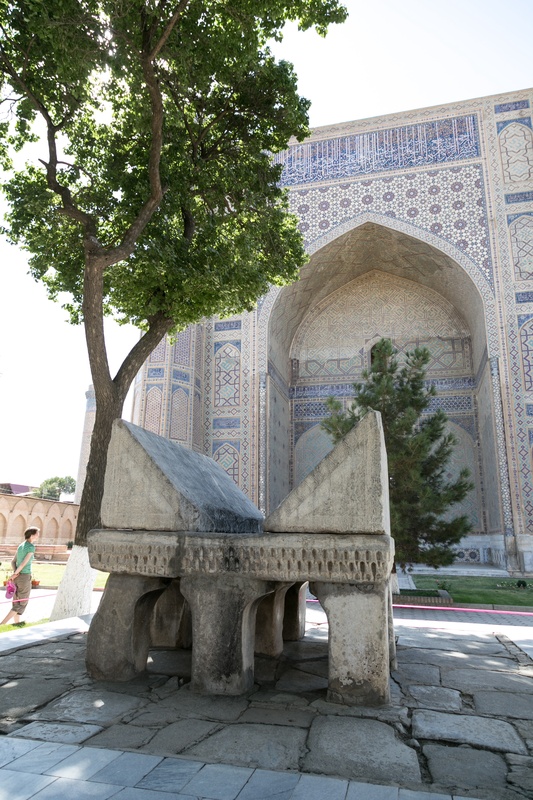 We were interested to see the huge stone Qur’an stand in the courtyard built for the massive Osman Qur’an which we saw in Tashkent. 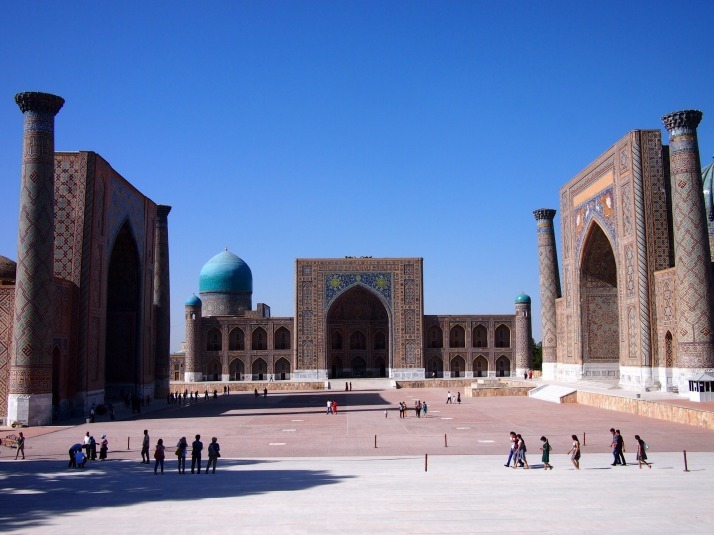 Shah-i-Zinda, the Avenue of Mausoleums, translates as ‘Tomb of the Living King’ and refers to the central tomb which is thought to be that of Qusam ibn Abbas, a cousin of the Prophet Mohammed, and one of the first to bring Islam to Central Asia in the 7th century. This is a place of pilgrimage today and there were far more Uzbek visitors here than at the Registan. 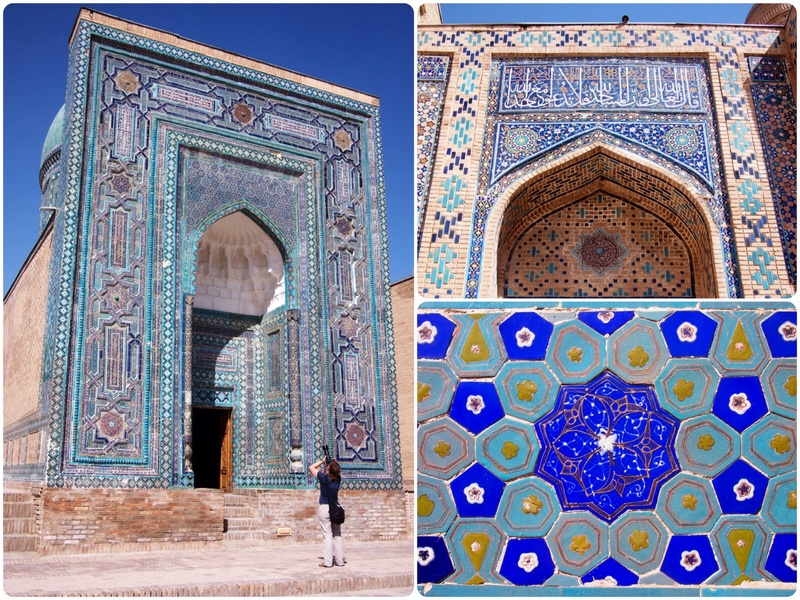 After he made Samarkand his capital, Amir Timur started to bury his family and favourites here too resulting in a concentration of richly decorated mausoleums lining the approach. Inside, some of them are rather austere with plain whitewashed walls while others are even more spectacular than their exteriors with delicately painted and tiled walls and ceilings. At the far end of the row of mausoleums was the equally fascinating city cemetery. 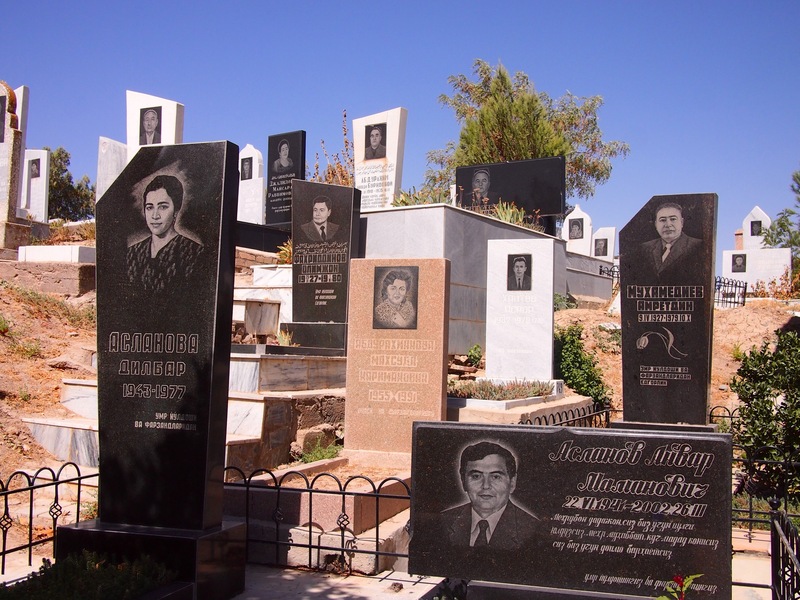 The grave stones are all carved with a portrait of the deceased along with their name and dates. It was interesting to see how the deceased were presented in their portraits (smiling, looking serious, or with full military medals) and we speculated about whether you had to have a photo portrait taken as you approached old age for the stonecarvers to work from. Transliterating the names was good practice for our Cyrillic reading skills too! 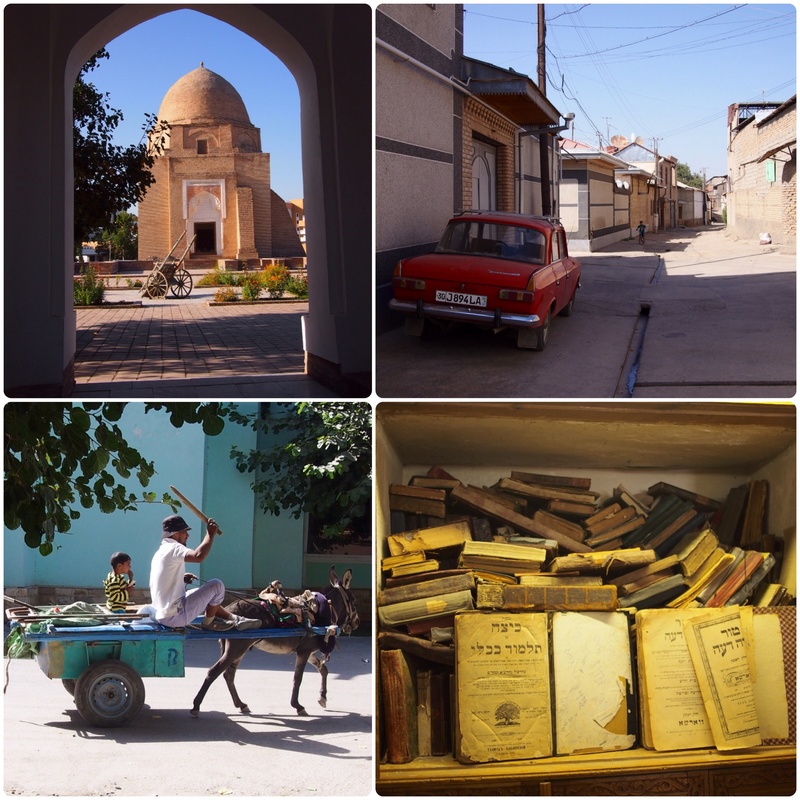 On a couple of occasions we ventured off the beaten tourist path into the narrow twisting streets of the old town. 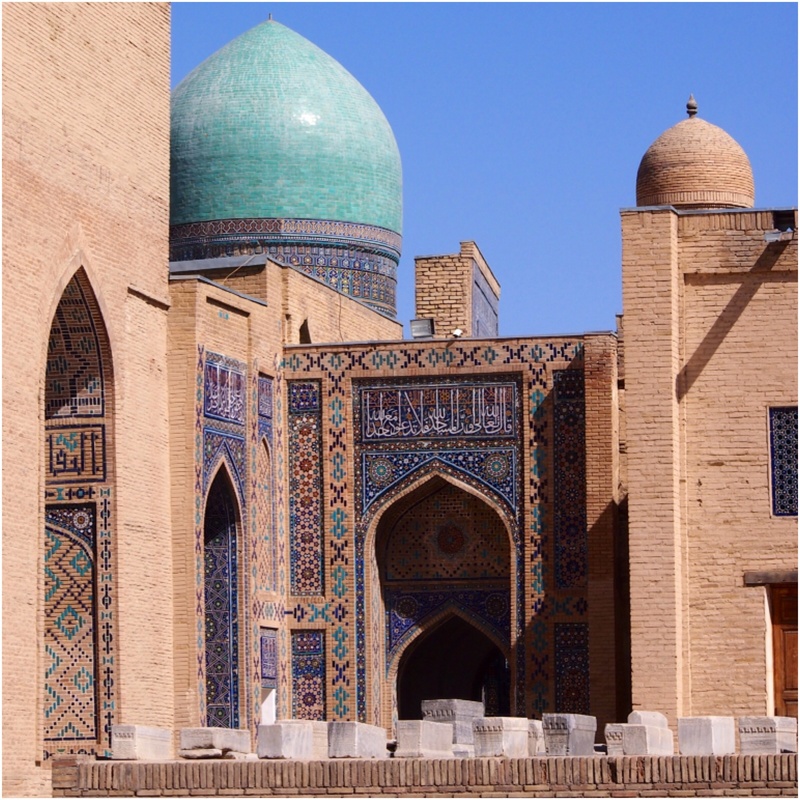 Traditional Uzbek houses are arranged around a courtyard so all that is visible from the street is a blank wall and a double door. Nevertheless we found plenty of life in the street and everyone was friendly and curious about where we are from. 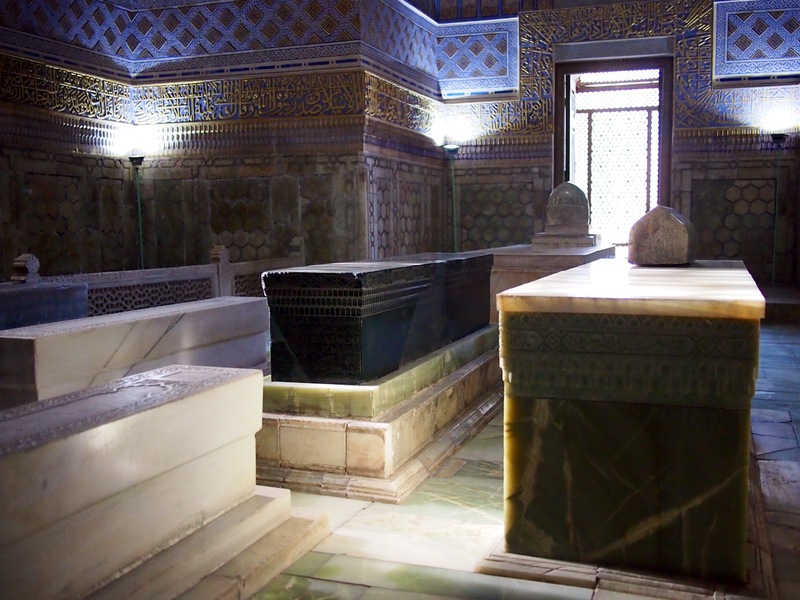 It was fun to stumble across little local mosques, mausoleums and even a synagogue in the old Jewish quarter. As a change from the historical monuments we followed a lead in the Lonely Planet to a wine factory in the newer part of town. We were expecting something quite basic so were surprised to be shown into a room hung with chandeliers which wouldn’t have been out of place in an English stately home. 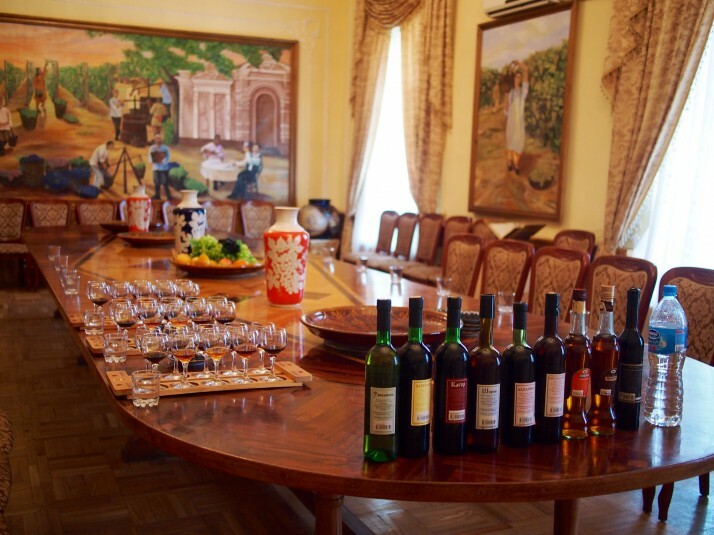 The lady hosting the tasting explained that because of the hot sunny climate of Uzbekistan, the grapes were high in natural sugars particularly suiting them to dessert wine production. We tried a mix of 3 wines, 6 dessert wines, 2 cognacs and a balsam (herbal liquer) and were impressed with the quality. 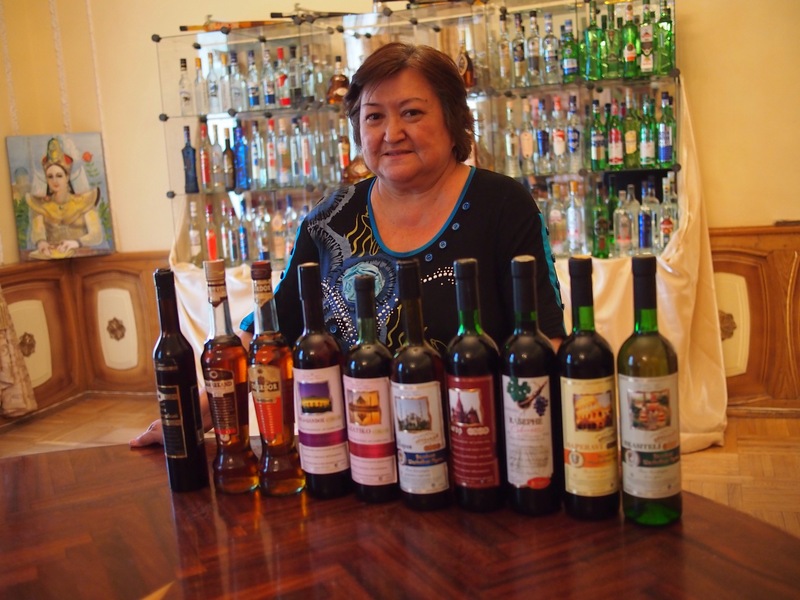 Unfortunately, production is limited at the moment so you’ll have to wait a while before you see Uzbek wines in your local off-licence. 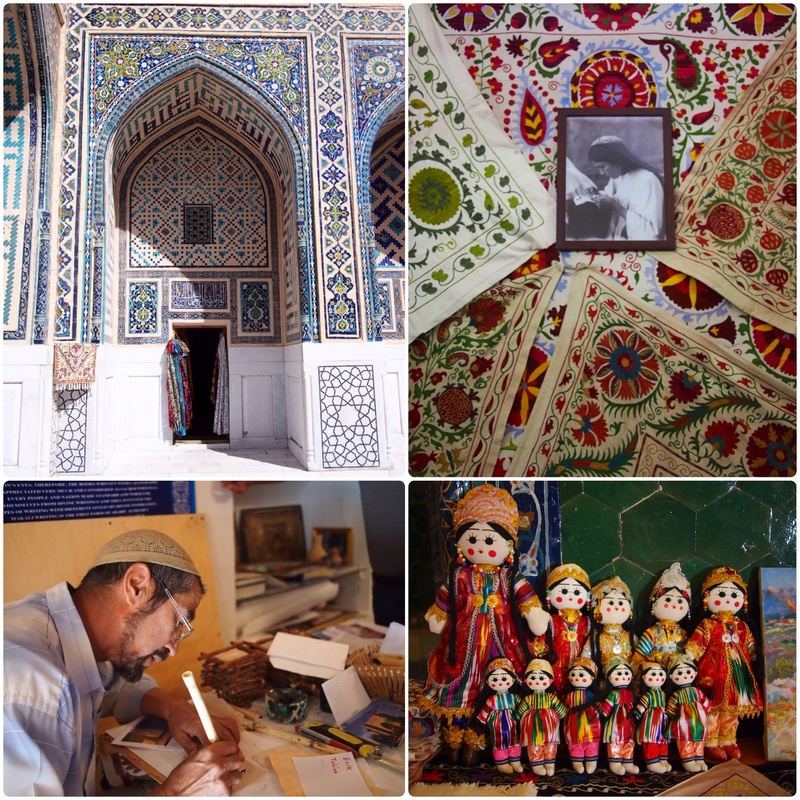 On our final day in Samarkand we took a day trip over the mountains to Amir Timur’s hometown and his second capital, Shakhrisabz. 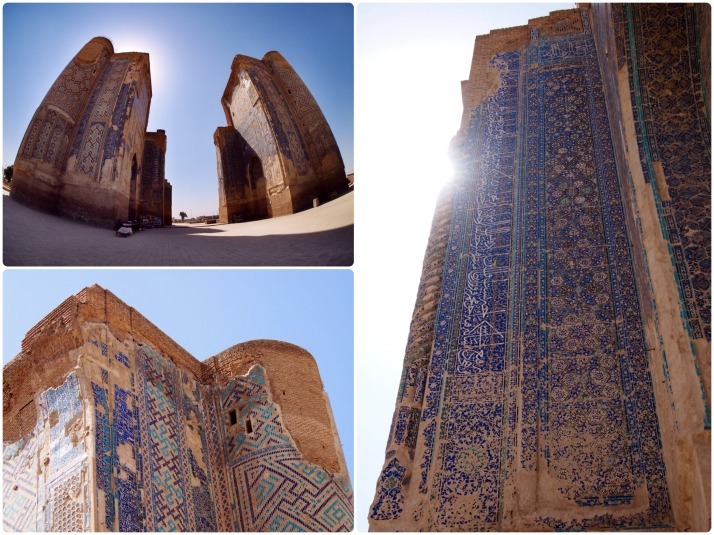 This city was once almost as impressive as Samarkand but nowadays is something of a backwater and its remaining monuments are in a pre-restoration state. 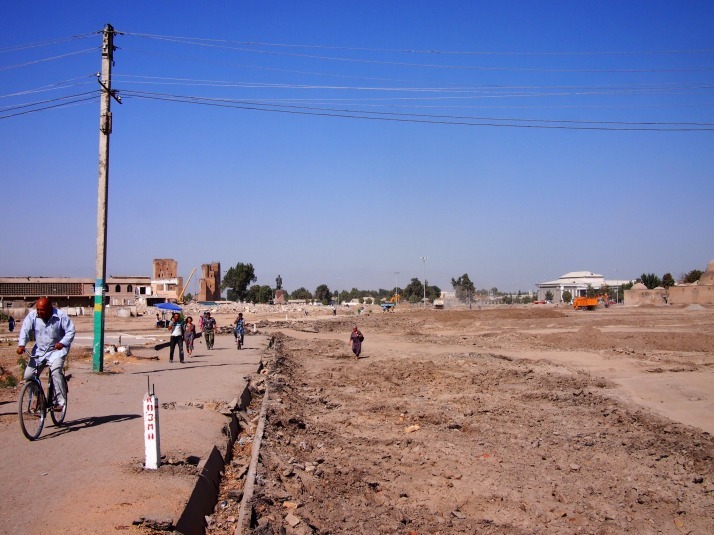 The government has decided to relandscape the town centre to ‘prettify’ it and for no readily apparent reason have dug up the whole lot at once creating a horrifically dusty building site for residents and visitors to pick their way through, though somehow our feet looked much dustier than the locals’. 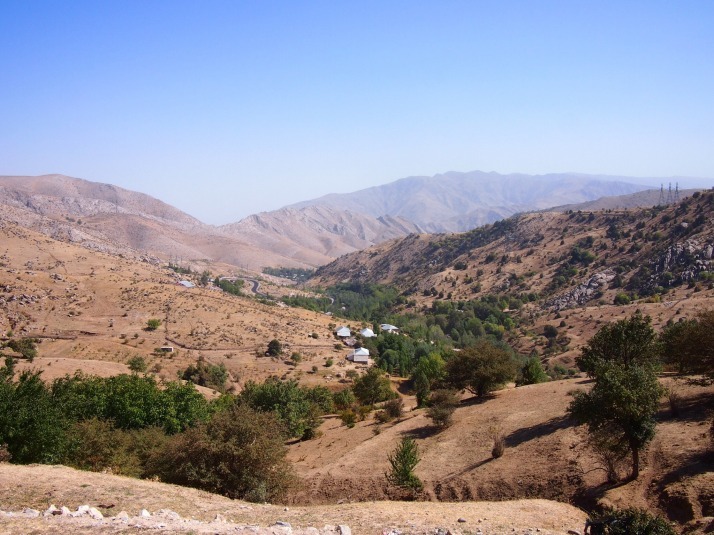 Shakhrisabz’s most important sight is the ruins of the Ak-Saray Palace. 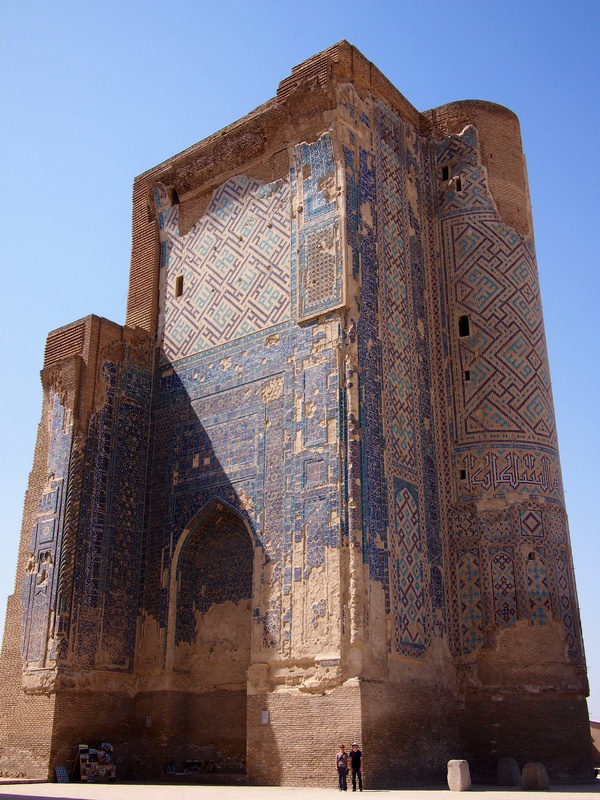 This was Amir Timur’s summer palace but all that remains is the craggy ruins of its entrance arch which stand at 38m tall and are separated by what would have been the 22.5m arch span. Given the scale of the entrance I can only imagine how impressive the rest of the palace must have been. We wandered along the building site like main street, stopping in the dusty bazaar for somsas (Uzbek pasties) and tea for lunch. At the other side of town from the palace are some more monuments. 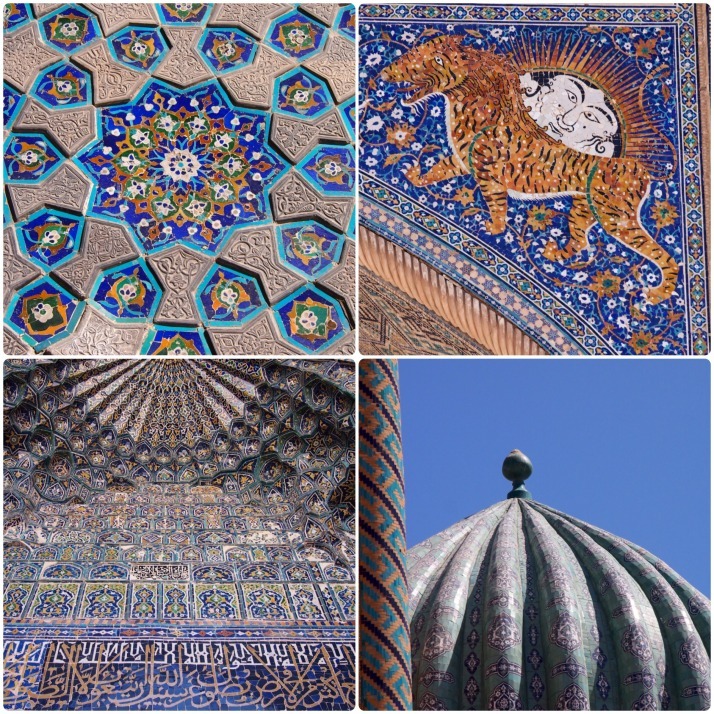 The Dorut Tilyovat complex contains the exquisite Kok Gumbaz mosque and two equally beautiful mausoleums. The buildings are situated around a peaceful tree-filled courtyard which was a very nice respite from the dust. Behind Dorut Tilyovat is the Khazrati Imam complex with its modern working mosque and the dilapidated remnants of what was once a huge burial complex. 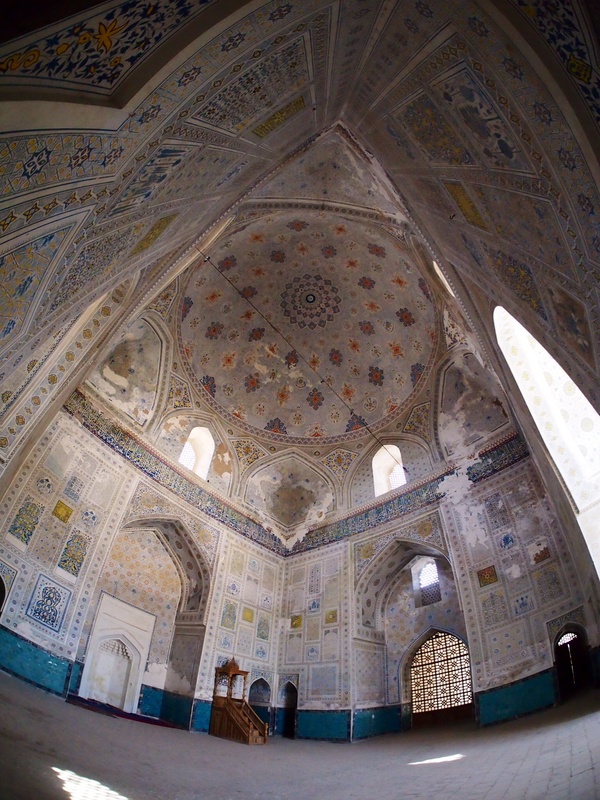 There’s the tall Tomb of Jehangir with a conical roof which houses the remains of Amir Timur’s eldest son. Tucked away behind this is a set of stairs down to a small burial chamber which it is believed was intended for Amir Timur himself. 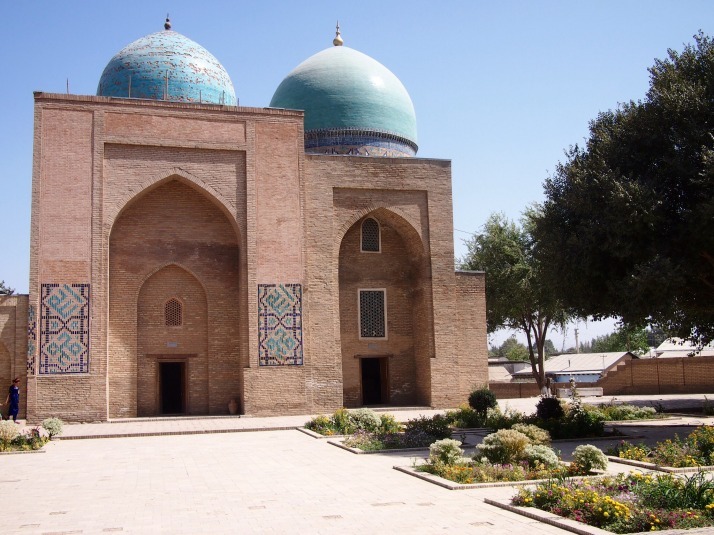 Unfortunately he died in the winter and the pass over the mountains was closed by snow so he was actually buried in Samarkand. There were far fewer tourists in Shakhrisabz than Samarkand and we found ourselves to be more than usual the subject of people’s curiosity. My curly hair in particular seemed to excite quite a lot of comment, we were talking to some ladies at a souvenir stall who, once they realised we weren’t going to buy anything, even asked if they could touch my hair! This entry was posted in Places and tagged mosque, Samarkand, Shakhrisabz, Uzbekistan on October 1, 2014 by Julie.